In a few short hours, a record in the video game industry will be broken, if they final bid price holds true. Right now on Ebay, one of only 116 known copies of the rare Nintendo World Championships game cartridge for the original Nintendo Entertainment System (NES) is up for auction. 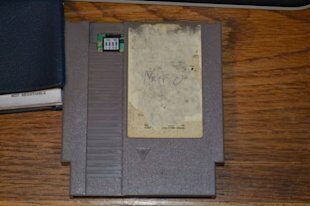 However, you wouldn’t know it by looking at the seller’s images as the label has been torn off and replaced with “Mario” scribbled across the game cartridge. Would you pay nearly $100,000 for this game? The Nintendo World Championships game dates back to 1990 when it was created for use in a video game tournament. The game includes playable levels of Super Mario Brothers, Tetris and Rad Racer. In addition to the traditional gray cartridge case, there were 26 gold plated versions that were given away by Nintendo Power magazine as a promotion. Below is a look at the game play. The rare Nintendo World Championships that is available on eBay now began with an initial bid of $5,000 and since then the game has received over 300 bids. With less than 6 hours remaining in the auction, the bidding is nearing $100,000 (current bid is $98,801). If the final bid holds true, it will exceed the previous record for the most expensive video game ever which is currently held by a prototype copy of “The Legend of Zelda” for the NES which received $55,000 at auction back in 2012. To put things in perspective for $100,000, gamers could have purchased 500 Nintendo Entertainment Systems at launch or one gaming console and roughly 2,400 games to go with it. Interestingly enough, the last time a copy of Nintendo World Championships was available for purchase was on an episode of “Pawn Stars” where the sellers was offering both a copy of the gray and gold plated versions for $35,000. Unfortunately Chumlee couldn’t make a deal with the seller. What do you think? Would you pay nearly $100,000 for a copy of Nintendo World Championships? What is your favorite video game of all-time?